You can accept online entries for practically any event with RiderHQ, first of all, browse our features page blog articles to see what we offer. Once you're ready, click list your event to get started. You don't need a user account for this (we'll create one as you go along) and there's no obligation or cost (you can always delete an event you've listed, as long as no one's paid for entry to it). Enter these basic details, and click 'List'. 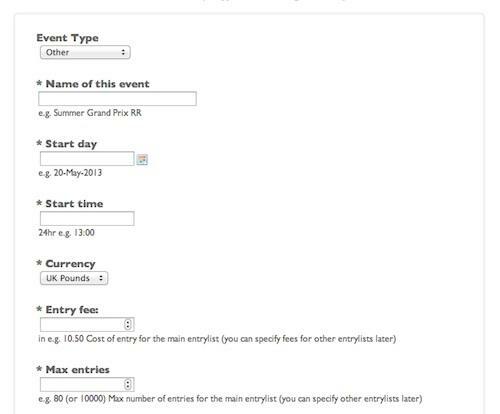 This will copy all event details to a new event (entry forms, entry lists, fees, rider limits etc.). This is also a good shortcut if you want to list a whole series of events (many of our leagues use it to quickly add a whole season's events in one go). You should now see your event page. This is your event 'dashboard' from here you can edit all the event details (via the 'Edit settings' button), get an overview of entrant activity, and manage your entrants. Your event is live immediately, and you can circulate links to your entry form, and event page, or embed the entry form in your website. You will also receive a confirmation email with links you can add to your website and publish in your press releases. discount: RiderHQ includes lots of discount features you can set up, for example a bundle discount: 'enter these 2 events for this price', or a 'bulk' discount: 'enter 3 events, get 10% off' or discounts for being a member of a certain group - you can set all these up from here. Online entries will automatically appear on the entrants list as riders enter. When the number of spaces reaches the maximum, no more entries will be accepted (you can also set a date when online entries will automatically close, sold out or not). If there are new entries we will send you a daily report showing a summary of how many entered and how many spaces remain (unless you switch it off in 'event settings'). You may also receive entries from other channels (e.g. 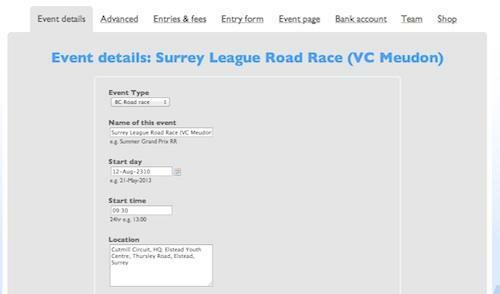 by post) - add these to the system by clicking the 'Add entry' link on the event page and inputting the entrant details (you can also upload entries in bulk, if you have a lot). There is no charge for managing these entries. 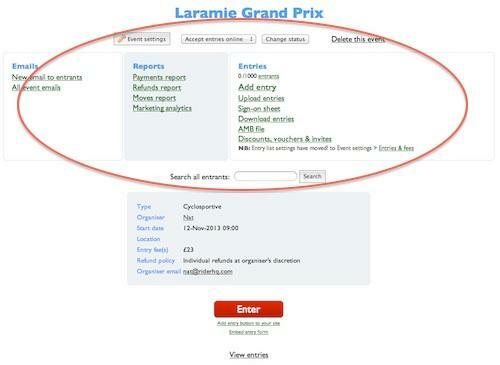 If you need to refund an entrant or move them to another of your events (or a different entry list in the same event) you can do so by finding them in the entrants list (there is a 'search' box on the main event page, or click on 'View entries' and find them there). Next to each name you will see 'refund...' and 'move...' links. You can also set up an automatic refund policy (with sliding-scale amounts) if you don't want to approve each refund manually and you can allow entrants to move themselves, if you prefer. Finally you can always review a live report of refunds and moves for each event. RiderHQ includes built-in bulk emailing, you can email entrants at any time and include 'merge fields' with entrant names and event links. Each email includes full 'unsubscribe' functionality and RiderHQ will ensure each mail is only sent to an address once, even if you re-send it so entrants won't receive lots of duplicate messages. Our emails can track opens, bounces and other statistics and support rich content, attachments and merge fields. More about emailing here. In addition to emailing entrants directly, you can set up an automatic email to go out when someone enters, for example providing details of your other events or instructions for attending. You can set an automatic close date in Event Settings>Entries & fees. Alternatively you can close entries manually from the event page (change 'Event status' and click 'save'). Once closed no more entries will be accepted, so as long as you don't re-open them, it's safe to print signing-on sheets etc. Print a signing-on sheet by clicking the 'Sign-on Sheet' link on your event page - this should give you a quick way to print out your sheet, or download a PDF which you can print, you can select which columns and customise the look too. Alternatively, if you want complete control over the layout, use the 'download entries' link which will give you a .csv (spreadsheet, should work in Excel etc.) file, listing all your entrant details which you can then format how you like. You can view a live payments report showing all entry fees collected at any time (from the link on your event page). We will send you a payments report and pay you any outstanding entry fees on the schedule you select. The first time we do this we will need to make a test payment to verify your bank account, but once done payments will go through automatically. That's the basics covered, RiderHQ has many more features and options, but hopefully this is enough to get you started. Contact us if you have any questions!